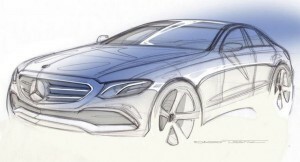 Mercedes-Benz has officially revealed the design sketch of the much anticipated 2017 E-Class sedan. The car is all set to make its debut globally on the 11th of January 2016. The 2017 Mercedes-Benz E-Class has been spotted testing on numerous occasions and is now ready for a global debut in a few days time. The car looks exactly mid way between the C-Class and the bigger S-Class where it will be actually positioned. The front might get full LED headlights with a sporty two-slated chrome grille with the big 3-pointed star in the middle or a more contemporary looking S-Class like grille with the logo placed just ahead of the bonnet. The sides are reasonably flared dropping into a familiar looking rear silhouette. The taillights will be all LED and look pretty similar to the ones on the C- and the S-Class sedans. There is generous use of chrome which points out to its luxurious air. The interiors, like the exteriors, is a mix and match affair between the C-Class and the S-Class. It will get the 4-vent layout in the middle of the dashboard like the S-Class, while rest of the floor centre console seems to be lifted from the lesser C-Class. Powertrains are expected to remain the same with the 2.2-litre twin turbo diesel and a bigger 3.0-litre V6 diesel uprated slightly to develop more power. Gearbox options could include the latest 9-speed automatic that was first seen on the GLE SUV in India. The car will also get an open-top version and not to forget, an AMG version as well which will be powered by a 4.0-litre V8 petrol motor. he features on the car were recently teased through a video which revealed a few gesture controls for the Comand system and automated lane changes as part of the Distronic suite of semi-autonomous driving features. The 2017 E-Class will also feature autonomous braking in case of an emergency situation. The 2017 E-Class has reportedly undergone more than 48 months and 12 lakh kilometers of testing in extreme conditions from -32 degree Celsius to +60 degree Celsius. Stay tuned for more updates as the launch of the all new 2017 E-Class nears.